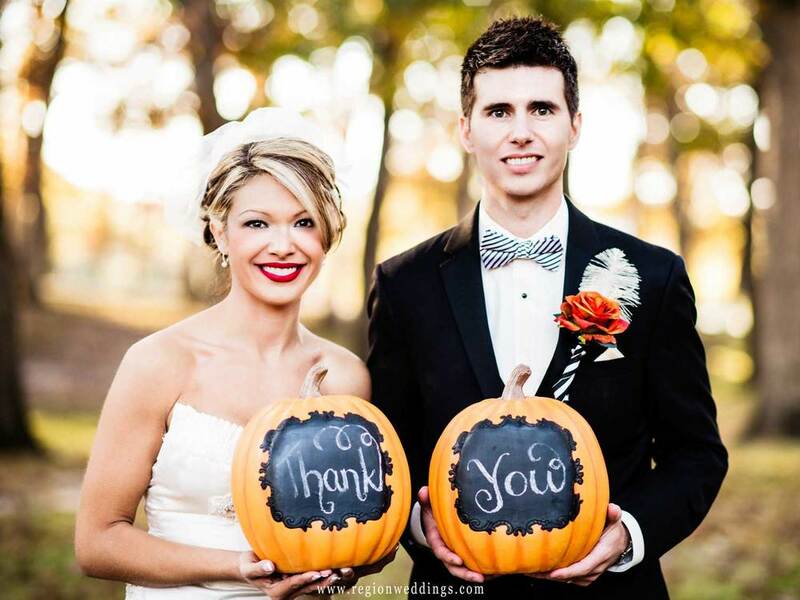 Bride and groom hold pumpkins engraved with Thank You. Krystin and Chachi's Fall wedding featured pumpkins, glowing amber uplighting on the dance floor, leaves, tall trees at Lake County Fairgrounds, a lovely Catholic wedding ceremony, high flying groomsmen on the dance floor and a whole lot of smiling faces from friends, family and the wedding party itself. Good times, indeed!! Oh, did I mention pumpkins?!! Our day started at Krystin and Chachi's home with the bride and her beloved puppy. The adjective I heard about Krystin all day was the word 'stunning'. The bride getting ready at her home in Crown Point, Indiana. Portrait of the bride at her home on the morning of her wedding. St. Mary's Catholic Church was filled all the way to the back for the ceremony. The full mass gave me opportunity to get shots from the balcony as well as floor level. The groom anxiously awaited his bride as Krystin's Dad walked her down the aisle. Wedding ceremony at St. Mary's Catholic Church. The bride and groom are married at St. Mary's Catholic Church in Crown Point, Indiana. After the ceremony we took family photos in the church and then it was off to the Crown Point Square for couple's photos and then Lake County Fairgrounds for some real Fall flavor. Bride and groom on the altar at St. Mary's Catholic Church. The groomsmen and the bridesmaids at Lake County Fairgrounds. Krystin's list of props included pumpkins, of course, but cute signs, thank you's, her dog Piper and more!! We had a lot of fun in the woods of Lake County Fairgrounds. The bride and groom hold a sign that states To Love and To Cherish. Wedding photos at Lake County Fairgrounds in Crown Point, Indiana. It was now time to get the party started at Villa Cesare in Schererville, Indiana. 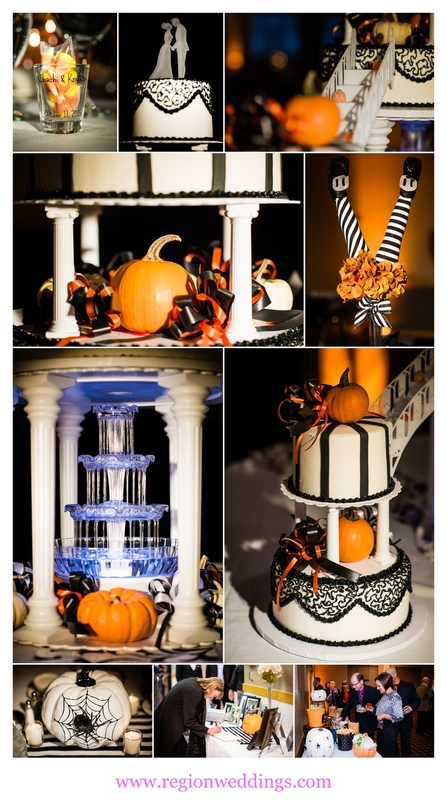 The first order of business though was to photograph the spectacular multi tiered wedding cake and all of the October Fall decorations. A multi tiered Fall decorated wedding cake at Villa Cesare Banquet Hall. Fall wedding decorations at Villa Cesare in Schererville, Indiana. First Dance for the bride and groom at Villa Cesare in Schererville, Indiana. Entertaining toasts were met with some great stories and laughter and the dance floor was packed all night. From young to old, everybody shook their moneymaker!! Everyone parties at a Fall wedding reception at Villa Cesare in Schererville, Indiana. Perhaps you have been enjoying a pumpkin spice latte while viewing this sneak peek look at Krystin and Chachi's Fall wedding at St. Mary's Church in Crown Point, Indiana. Stay tuned for more on social media list below.